It felt a long time coming…and in a sense it has been, given that it’s been eight months since the fleeting on-screen introduction of Peter Capaldi as the ‘new’ Doctor. Ever since those closing moments of Matt Smith’s departure in the 2013 Christmas Special (“The Time of the Doctor”), viewers – both casual and committed – have waited with baited breath, even a healthy amount of trepidation, to see how Capaldi (himself a life-long fan of Doctor Who) would fare as the new master of the TARDIS. To fully assess Capaldi after only one full outing (and an extended ‘feature length’ one at that) is wholly unfair but given his mesmerising and captivating turn in “Deep Breath”, the iconic time machine would seem to be in safe hands. In one episode Capaldi delivers tantalising glimpses of all we’ve been promised, a darker, more cantankerous and enigmatic version of the Doctor that lends a welcome feeling of freshness to the series as though it were November 1963. Some will have no doubt found the transition to Capaldi jarring, it’s certainly fair to say that David Tennant and Matt Smith are tough acts to follow, but a return to a more Hartnell-esque version of the character feels the right direction to follow, returning the series to its roots as it moves past last year’s 50th anniversary. Despite the darker moments, Capaldi reminds us that he’s still the Doctor and allows those familiar quirks and inklings of levity to seep through as he clearly has fun with the Gallifreyan Time Lord’s bumpy and confused transition to his new – older – form. In fact, Capaldi’s madcap post-regeneration daze and confusion is pleasingly reminiscent of Jon Pertwee’s debut in classic 1970 Who serial “Spearhead from Space”. Capaldi is served well by writer Moffat, who spices the episode’s script with affectionate nods to the show’s past (references to those “round things” that furnished the classic TARDIS interior, for example) and not so subtle references to the Doctor’s new found ‘Scottishness’ (and provoking reaction to the forthcoming referendum). Whilst the episode itself has its less assured and weaker moments with its slightly messy plot and at times underwhelming villain it also captured some of the magic of a Christmas Special via it’s Victorian period setting and roaming CGI dinosaur. Despite a rather slow start, “Deep Breath” soon gathers pace and takes us on the ride viewers always expect from the series. On the whole it certainly could have been better, but where “Deep Breath” truly shines is in its focus on the Doctor and Clara and the changing dynamics of their relationship. In many ways Clara represents the viewer – unsure and a little hesitant and even baffled at the Doctor’s new form and both Coleman and Capaldi handle these moments deftly as they begin to discover a bond that is much more that of niece and uncle than the unrequited and flirtatious yearnings of Tennant and Smith’s respective tenures…another example of returning to the show’s roots – and emerges all the better for it. As I’ve cited, it’s all bound to be jarring for many (new title sequence and reworked theme music notwithstanding), perhaps especially in the case of younger viewers used to a lighter and more youthful interpretation of the heroic Time Lord, but as “Deep Breath” draws to a close the Doctor has begun to settle in to his new form and ready to hurtle, TARDIS first, into a new era for one of the most enduring and popular of all of SF television. The bottom line: Change is inevitable and whilst some viewers may initially find the transition uneasy, the talented Peter Capaldi clearly displays potential and gives viewers promising glimpses of a new era for Doctor Who. Capaldi previously appeared in “The Fires of Pompeii” during David Tennat’s 2008 season of Doctor Who, as well as Home Office Secretary John Frobisher in the “Children of Earth” serial of spin-off series Torchwood. Doctor Who season 8 airs in the UK Saturday evenings on BBC 1. US viewers can catch it on BBC America. 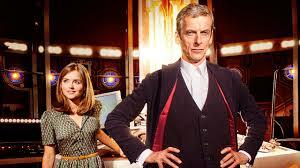 What did you think of Peter Capaldi’s debut as the Doctor? Share your thoughts below!